1. The front lays on the press must be set to feed the sheets squarely into the first unit of the machine. The practice of adjusting the front lays to obtain register must not be followed on the multicolour press. 2. Image register between one unit and another is achieved by adjusting the position of the plates. Pin register plate clamps are commonly used to assist in plate register. 3. Each printing unit incorporates mechanisms for adjusting the lateral and circumferential register of the plate cylinders. 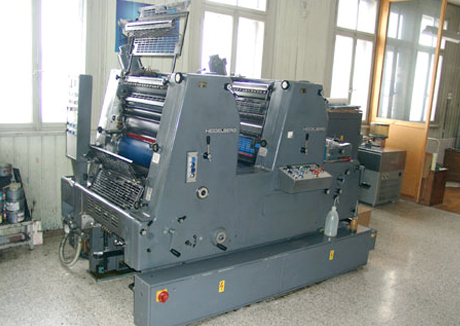 Many press designs allow this adjustment to be performed while the press is running. 4. The multicolour press prints 'wet-on-wet', that is, each successive unit impresses a wet film of ink upon wet ink from the previous unit. This may produce ink trapping problems and is remedied by lowering the ink tack on each of the following units. 5. Remote control and computerised systems for automatic adjustment of the ink ducts are of great value in reducing makeready times on the multicolour press. Process colour printing on the four colour press is a simpler operation than that on the single colour press because the final full colour print can be assessed for colour balance after one pass through the machine. The imposition of four films of ink onto the sheet may lead to ink set-off. Accelerated ink drying systms are an answer to this problem, and permit rapid turn around of printed work for perfecting. A new development in colour separation techniques known as Achromatic Separation produces four colour separation sets with a greatly reduced level of ink in the colours cyan, magenta and yellow. This is turn lowers the possibility of set-off in wet-on-wet printing. The standard of quality for the job is set when the pass sheet is obtained. This establishes the image position, register, image quality, ink density and half tone reproduction quality. During a run of many thousands of sheets perhaps occupying several days, the pass sheet standard must be maintained while room lighting changes from daylight to artificial lighting, and often when there is a change of pressmen on working shifts. Quality control therefore should not be left to the estimation of the individual pressman whose visual judgement over a long period may alter with eye fatigue and a change in room lighting. The Star Target is a device designed by the Graphic Arts Technical Foundation of America but it has its counterparts throughout the world. The Target is a wheel-shaped design printed down into the trim areas of the sheet. Its main function on the press is to indicate dot gain or dot loss in half tones, but it also indicates press slur and doubling. When dot gain occurs during the run the centre of the Target fills in and indicates gain before it becomes visible in the half tone subjects on the plate. Dot loss produces an open area in the centre of the Target. Press slur is indicated by a figure of eight appearing in the Target centre, doubling produces a moire pattern in the Target. Solid patches in the bar give solid density readings of the thickness of the printed ink film. At the pass sheet stage solid density readings are taken and these are used during the press run to maintain the ink level. The printed ink density changes as the ink penetrates the stock and dries, therefore densitometer readings of the solid patches are usually taken after a timed interval, say of one minute, and this interval is observed throughout the run. Trapping patches in the bar are solid areas which when printed in two or more colours are superimposed on one another. The Cyan is first printed and the density of the trapping patch evaluated with the densitometer. When this is overprinted by the Yellow the densitometer is used to compare the density of the Yellow on its own against the density of the Yellow over the Cyan. Any discrepancy between the two readings indicates trapping error. Percentage tints are placed in the bar and are used to check the degree of dot gain due to squeeze between plate, blanket and stock. Most litho presses produce a gain of approximately 5% so that a tint patch of 25% printed onto the plate will produce a tint of 30% on the printed sheet. This type of gain may not be uniform however, with heavier tints showing more gain than lighter tints. Percentage tints incorporated in control bars therefore range from 15 % to 80 %. Dot gain may be lowered by experimenting with different grades of blanket, change in printing pressures and the viscosity of the ink. Percentage tints will aid in the process of using any of these remedies. Grey balance patches consist of half tone patches in Magenta, Cyan and Yellow which when superimposed produce a grey. This grey is usually compared to a grey patch alongside in the bar which is produced by a black tint, or may be compared to a printed scale of greys held in the pressroom. Any shift away from neutral grey will indicate a predominance of one of the printed colours. This is an electrical instrument used for taking density readings from colour control patches. The instrument contains a light source which is focused on the printed control patch and the reflected light passes through a filter into a photocell to give a dial or digital reading of the density of the ink film. A complementary filter to the colour being evaluated is used so that the ink colour is rendered black to the photocell. Polarising filters in the densitometer minimise the differences between highly reflective and matt surfaces. Sophisticated densitometers may also offer facilities for measuring the surface reflectivity of the stock, the press contrast factor and half tone density. A quality control chart is often used with the reflection densitometer. The pass sheet density readings are taken and recorded onto the chart. Subsequent readings are taken during the run at predetermined intervals and recorded on the chart to indicate clearly the movements of ink density. If the printed ink density goes beyond the tolerance limits (the limits where density changes become obvious to the eye) the parts of the job where this occurred can be determined thus making stock sorting an easier task.